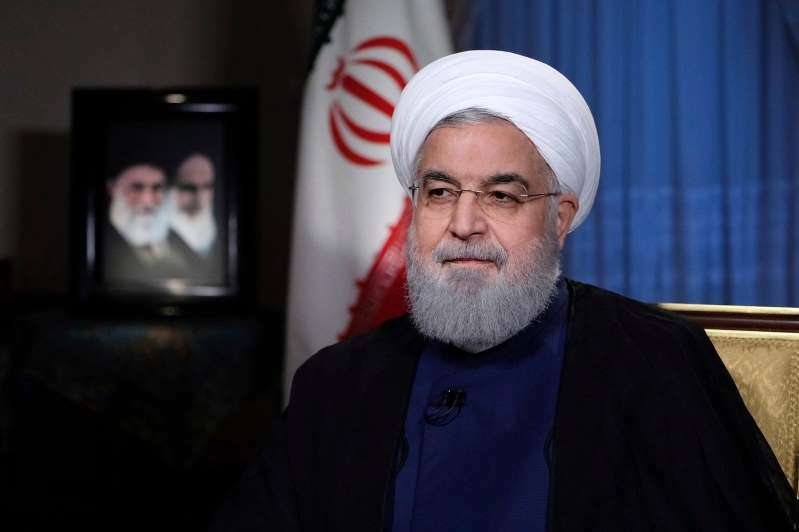 In this photo released by official website of the office of the Iranian Presidency, President Hassan Rouhani addresses the nation in a televised speech in Tehran, Iran, Monday, Aug. 6, 2018. For the first time in more than a year, Iran test-fired a ballistic missile in a brazen display of defiance months after President Trump pulled the United States out of a landmark nuclear deal and days before his administration slapped new sanctions on the Islamic Republic, three U.S. officials with knowledge of the launch tell Fox News. The test of an Iranian Fateh-110 short-range ballistic missile coincided with a large-scale naval exercise by Iran’s Revolutionary Guard forces late last week involving over 50 small gunboats in the Strait of Hormuz to rehearse “swarm” tactics which could one day potentially shut down the vital waterway, through which 30 percent of the world’s oil passes each year. While the U.S. military publicly acknowledged the naval activity, the missile test from an Iranian Revolutionary Guard Corps base in Bandar-e-Jask in southeastern Iran has not been previously reported. The launch was detected by a U.S. spy satellite. [post_ads]According to the officials, the anti-ship Fateh-110 Mod 3 flew over 100 miles on a flight path over the Strait of Hormuz to a test range in the Iranian desert. “It was shore-to-shore,” said one U.S. official describing the launch, who like the others requested anonymity to discuss sensitive information. There were no U.S. military assets nearby or in danger when Iran conducted the test, the official added. The guided-missile destroyer USS The Sullivans has been escorting vessels through the strait in recent days. A Pentagon spokesperson declined to comment on the Iranian ballistic missile launch. Last week’s missile launch is the first known test of the Fateh-110 in over a year since a pair were launched on consecutive days in March 2017. One of the missiles last year destroyed a floating barge roughlyy 155 miles away, two U.S. officials said at the time. The top American commander for U.S. forces in the Middle East told reporters Iran’s recent naval activity was meant to “send a message” to the United States. "I think it's pretty clear to us that they were trying to use that exercise to send a message to us that as we approach this period of the sanctions, they had some capabilities," Gen. Joseph Votel said at the Pentagon Wednesday. It’s not immediately clear if the missile test occurred Thursday or Friday, but U.S. officials say it occurred as part of Iran’s annual naval exercise, moved up from its typical fall timeframe ahead of the new sanctions imposed this week. “It’s routine to see Iran doing a missile test during this annual drill,” one official said. Earlier this week, John Bolton, President Trump’s national security adviser, said the new U.S. sanctions placed on Iran Tuesday were meant to pressure the government in Tehran over its military activity in the Middle East and its ballistic missile program. In an interview on Fox News, Bolton said the new sanctions targeting Iran’s automotive and airline sectors were not to bring about “regime change” in Iran despite dozens of protests taking place throughout the country and its currency losing value. U.N. resolution 2231 -- put in place days after the Iran nuclear deal was signed -- calls on the Islamic Republic not to conduct ballistic missile tests. The resolution bars Iran from conducting ballistic missile tests for eight years and went into effect July 20, 2015. But critics say the resolution leaves wiggle room by saying Iran is “called upon” not forbidden from carrying out such tests. Iran is "called upon not to undertake any activity related to ballistic missiles designed to be capable of delivering nuclear weapons, including launches using such ballistic missile technology," according to the text of the resolution. Despite this most recent example of Iranian saber rattling, its notable Iran has not harassed any U.S. warships or aircraft in nearly a year. The last unsafe interaction occurred nearly a year ago on Aug. 14, 2017, when an Iranian drone flew too close to an F/A-18 Hornet attempting to land aboard the aircraft carrier USS Nimitz, according to the Navy. Last September, Iranian state television aired footage of a ballistic missile launch of what Tehran described as a new type of medium-range ballistic missile hours after displaying the missile in a parade in Tehran, but the missile launch turned out to be fake and copy of a failed launch the previous January, according to U.S. officials. The failed late January launch was first reported by Fox News and prompted the White House to put Iran “on notice” days later. A year earlier, Iranian forces captured the crew of two small U.S. Navy patrol boats that strayed into Iranian waters in the Persian Gulf. The 10 American sailors were released roughly a day later. Note: If you think this story need more information or correction, feel free to comment below your opinion and reaction.